It has been known for some time that when a fetus is exposed to alcohol (i.e., a pregnant woman drinks alcohol) alcohol disrupts neurogenesis in the fetal brain leading to neuron degeneration and neurological dysfunction after birth. However recent research has shown that alcohol (as well as disease injury and drug abuse) can significantly disrupt neurogenesis or the birth of new neurons in the brain—specifically in the adult hippocampus. Actually it was only recently that scientists even discovered that new neuron growth occurs after birth and well into adulthood. Using new technological tools scientists have found dividing cells (stem cells) in the adult hippocampus that give rise to neurons. Stem cells have unique qualities—they can divide indefinitely renew themselves and mature into a variety of daughter cells—in this case, neurons. These stem cells give rise to new neurons that incorporate into the hippocampal circuitry, thereby facilitating the ability to form new memories. 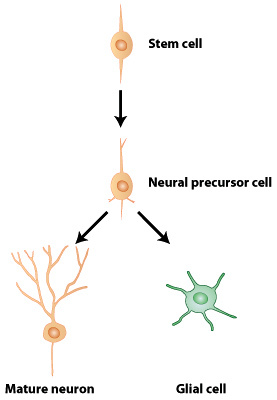 Figure 3.3 Neural stem cells give “birth” to new neurons which then migrate to specific areas in the hippocampus where they participate in the formation of memory. The inhibition of hippocampal neurogenesis by alcohol may contribute to the memory problems that occur with alcoholism. In experiments with rats, it has been shown that a single dose of alcohol, equivalent to a drinking binge in humans, can sufficiently damage the hippocampus to cause severe, lasting disruptions in learning and memory. Though the exact mechanism is under investigation, scientists hypothesize that alcohol halts the growth of neural stem cells and/or actually causes their death. The ability of alcohol to affect memory may be due, in part, to its ability to inhibit the formation of new neurons or neurogenesis in the hippocampus.